HISTORY, we all know, is replete with unsung heroes. “But should they remain unsung?” questions eminent Punjabi playwright Dr Atamjit. 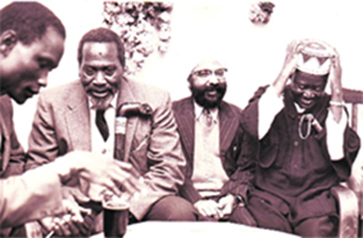 So taking upon himself the onerous task of bringing these unsung heroes to light, he penned a play Mungu Comrade on the life and struggle of a Sikh Kenyan freedom fighter, Makhan Singh. Now he has turned his attention to several unknown heroes of the Gadar Party, who along with the popular ones like Lala Hardayal, become protagonists of his latest play Ghadar Express. Gopal Singh and Makhan Singh (aged 20) Nairobi, May 1933. Photo by TL Patel.